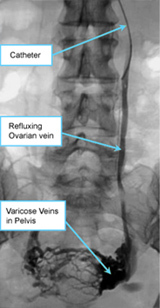 OVE/Pelvic Congestion is an examination of the blood vessels using x-rays and contrast (x-ray dye). A specialist known as an Interventional Radiologist often performs these procedures. The contrast is injected through a thin plastic tube called a catheter, which is passed through a sheath inserted into the femoral vein. Ovarian vein embolisation is a minimally invasive treatment for pelvic congestion syndrome that is used to stop blood flow through incompetent veins so they can no longer enlarge with blood, thus relieving the pain. Pelvic congestion syndrome, also known as ovarian vein reflux, is a painful condition resulting from the presence of varicose veins in the pelvis. The condition is caused by valves in the veins that help return blood to the heart against gravity becoming weakened and not closing properly, allowing blood to flow backwards and pool in the vein causing pressure and bulging veins. After the procedure you may experience mild-moderate pelvic discomfort which should resolve over the following few days with original symptoms resolving over the next few weeks. You should only require oral pain medication to help relieve symptoms.